Orthodontics, the oldest of the dental specialties, focuses on the diagnosis and treatment of dental and associated facial irregularities. Orthodontic treatment allows us to bring the teeth and jaws into harmony three-dimensionally. The results of orthodontic treatment can be dramatic - beautiful smiles, improved dental health, and an enhanced quality of life for people of ALL ages. Dr. Golden follows the recommendation of the American Association of Orthodontics, which recommends an orthodontic screening for each child around the age of seven or about the time of the eruption of the upper permanent front teeth. This permits the identification of any developing problems as well as the initiation of any indicated interceptive treatment. In the majority of cases, treatment will not begin until much later. However, because of the instances in which a child would benefit from treatment at a younger age, it is important that everyone be at least evaluated at an early age. Knowledge of developing problems combined with right-on-time treatment brings peace of mind to the parent and the child. The most profound treatment results come from the correction of growth imbalances. This is one of the reasons that it is most beneficial to screen for problems around the age of seven - while there is still significant facial growth remaining. Adults can be treated at any age. It is never too late to enjoy the benefits of a beautiful smile. Some adults have missing teeth which may cause abnormal movement of the remaining teeth. Some may have had braces earlier in life, but the teeth have shifted. Many adults never had orthodontic treatment, and could benefit greatly from a beautiful, healthy smile. Dr. Golden enjoys treating patients of ALL ages: children, adolescents, and adults. She is happy to provide comprehensive initial examinations at no charge. We are committed to providing you with the best smile possible, both from an esthetic perspective as well as for health and function. Although we always work closely with your general dentist to accomplish these goals, it is sometimes necessary to work with other specialists as well. These specialists may include oral surgeons, periodontists, endodontists, prosthodontists, or pedodontists, etc. We eagerly work with these other practitioners using a “team approach” to provide you with the best possible experience and results. Crowding of the teeth is the most common problem associated with the need for orthodontic treatment. Many factors contribute to dental crowding. The most common reason for crowding is a discrepancy between the space available in each jaw and the size of the teeth. Crowding can lead to impacted teeth, a "bad bite", and an unesthetic appearance. 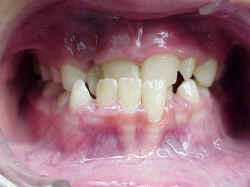 Spaces between teeth are another common problem associated with the need for orthodontic treatment. Like crowding, spacing is also often caused by a discrepancy between the space available in each jaw and the size of the teeth. Spacing can also arise from teeth that are missing or are smaller than normal. Overjet is defined as the horizontal protrusion of the upper teeth in front of the lower teeth. Overjet is often seen with a Class II malocclusion, which occurs when the top jaw is located ahead of the bottom jaw (due to a large top jaw, a small bottom jaw, or a combination of the two). Thumb and finger sucking habits can also cause excessive overjet. Overbite is defined as the vertical overlapping of the upper teeth over the lower teeth. A deep overbite (or deep bite) occurs when the upper front teeth completely (or mostly) cover the lower front teeth. Often, this causes the lower front teeth to bite on the gums behind the upper front teeth, causing damage to the gum tissue and underlying bone. An openbite is defined as a lack of vertical overlap of the incisor (front) teeth. It results when the upper and lower front teeth do not touch when biting down. An openbite can be caused by abnormal growth of one of both jaws or it can be caused by a thumb or finger sucking habit. In some instances, a tongue thrust (which occurs when the tongue moves between the front teeth during swallowing) may also be a contributing factor to an openbite. When biting down, the space between the upper and lower front teeth causes excessive pressure on the back teeth. Over time, this excessive pressure can cause abnormal tooth wear on the back teeth, or problems with the gums and bone surrounding the back teeth. An underbite occurs when the lower front teeth protrude in front of the upper front teeth. It is often seen with a Class III malocclusion, where there is a large lower jaw, a small upper jaw, or a combination of the two. An underbite is also known as an anterior crossbite. A crossbite occurs when the top teeth fit inside of the bottom teeth. In a normal jaw relationship, the top teeth should be located outside of the bottom teeth. A crossbite can occur with the front teeth (anterior crossbite) or with the back teeth (posterior crossbite). Posterior crossbites usually result from a narrow or constricted upper jaw. Crossbites can cause problems with biting and chewing.